^ "Obituary (The New York Times)". Retrieved 2009-12-27. ^ Kaplan, Fred (October 2007). "Chapter 1: The Best Boy You Had 1835–1847". The Singular Mark Twain. Doubleday. ISBN 0-385-47715-5. Cited in "Excerpt: The Singular Mark Twain". About.com: Literature: Classic. Retrieved 2006-10-11. ^ "Nautical Dictionary, Glossary and Terms directory: Search Results". www.seatalk.info. Retrieved 2017-08-17. ^ Gunderman, Richard (12 February 2018). "Mark Twain's adventures in love: How a rough-edged aspiring author courted a beautiful heiress". The Conversation. Retrieved 12 February 2018. ^ Zwick, Jim (2002). "Mark Twain and Imperialism". In Shelley Fisher Fishkin. 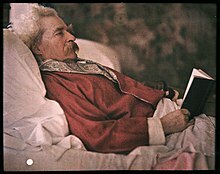 A Historical Guide to Mark Twain. New York: Oxford University Press. pp. 240–241. ISBN -0-19-513293-9. 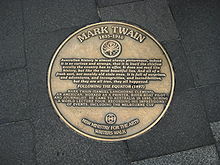 ^ "Mark Twain in Montreal". twainquotes.com. New York Times. Retrieved 2 January 2017. ^ "The Genial Mark". University of Virginia Library. Toronto Globe. Retrieved 2 January 2017. ^ a b c d "Mark Twain in Toronto". Toronto Reference Library Blog. Retrieved 2 January 2017. ^ Twain, Mark (2010). Kiskis, Michael J., ed. Mark Twain's own autobiography: the chapters from the North American review (2nd ed.). Madison, Wis.: University of Wisconsin Press. ISBN 9780299234737. OCLC 608692466. ^ Esther Lombardi, about.com. 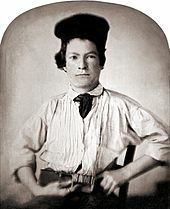 "Mark Twain (Samuel Langhorne Clemens)". Retrieved 2006-11-01. 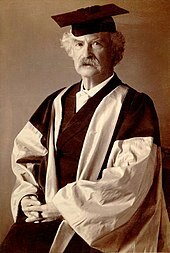 ^ "Mark Twain's Letters 1886–1900". Mark Twain Classic Literature Library. Retrieved 8 January 2015. ^ Gelb, Arthur (August 24, 1962). "Anti-Religious Work by Twain, Long Withheld, to Be Published". The New York Times. p. 23. ISSN 0362-4331. Retrieved 2008-04-22. 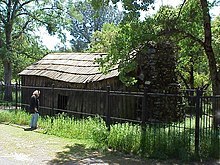 ^ "Church Aided by Twain Is in a Demolition Dispute". The New York Times. Associated Press. April 2, 2006. Retrieved 2008-10-05. ^ Kathryn Jenkins Gordon (August 18, 2015). "What Mark Twain Really Thought About Mormons". LDS Living. Retrieved 2015-10-27. ^ Adam Gopnik (August 13, 2012). "I, Nephi". The New Yorker. Retrieved 2015-10-27. ^ Twain, Mark (2010). Fishkin, Shelley Fisher, ed. Mark Twain's book of animals. Berkeley: University of California Press. p. 26. ISBN 9780520248557. OCLC 667015000. ^ Williams, III, George (1999). "Mark Twain Leaves Virginia City for San Francisco". Mark Twain and the Jumping Frog of Calaveras County: How Mark Twain's humorous frog story launched his legendary career. Tree by the River Publishing. ISBN 0-935174-45-1. Cited in "Excerpt: The Singular Mark Twain". Retrieved 2007-06-26. ^ Lemaster, J. R; Wilson, James Darrell; Hamric, Christie Graves (1993). The Mark Twain encyclopedia. Garland Publishing. p. 390. ISBN 978-0-8240-7212-4. Retrieved 2009-10-16.